Unique, one-of-a-kind metallic grayish blue unheated Burma 4.67 carat Sapphire cushion. 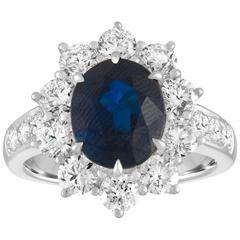 This spectacular gem is a fantastic choice for a unisex engagement or cocktail custom ring. AGL certificate is attached in the image scroll for your convenience.